…I guess it was time to sink or swim. In my opinion…smartest move yet! 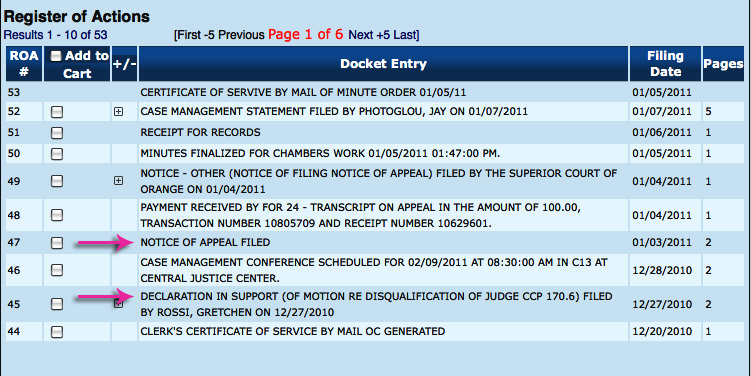 Court records for Orange County indicate there was a Case Management Conference yesterday at 8:30 a.m. in the case of Jay Photoglou VS. Gretchen Rossi. 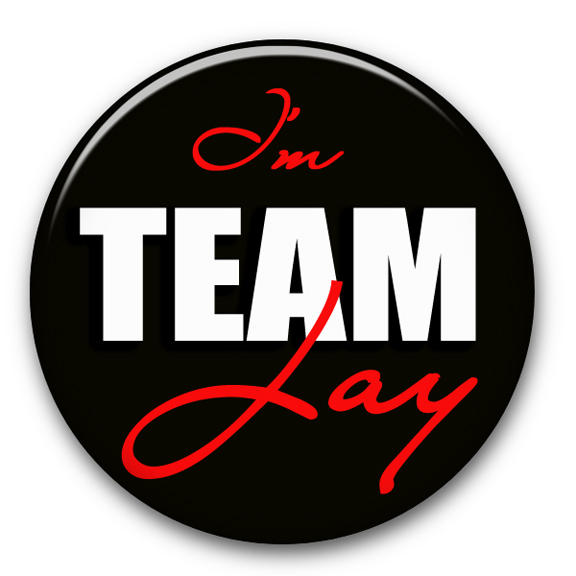 A Jury Trial has been scheduled for 9/12/11, this is 1 day before the 3 year anniversary of Jeff Beitzel’s passing. Defendant’s request for judicial notice is denied, since it does not appear that documents in the other 2 actions are relevant to the motion before the Court. Plaintiff’s motion for a stay of enforcement of judgment is denied. The motion is premature as no judgment has yet been entered. It is also denied on the merits as moving party has not shown that a stay is warranted based on the factors set forth in CCP 918.5(b). Defendant to give notice. (1) The likelihood of the judgment debtor prevailing in the other action. (2 ) The amount of the judgment of the judgment creditor as compared to the amount of the probable recovery of the judgment debtor in the action on the disputed claim. (3) The financial ability of the judgment creditor to satisfy the judgment if a judgment is rendered against the judgment creditor in the action on the disputed claim. Apparently, not even a reality ‘star‘/entrepreneur is above the law. When you’re ordered to pay over $22,000 in attorney fees and fail to do so, a bench warrant might be issued. When you finally do make good on your debt, you really can’t pick and choose who you’re going to pay it to either. It will eventually catch up to you! Unfortunately, it also appears that the legal system does not have preferred return customer policy. For example, if you are, once again ordered to pay at or around $40,000 in attorney fees, trying to have the judge disqualified probably wont work. Gosh…in the eyes of the law, you they really are no different than us ‘plain folk.’ That’s the reality. 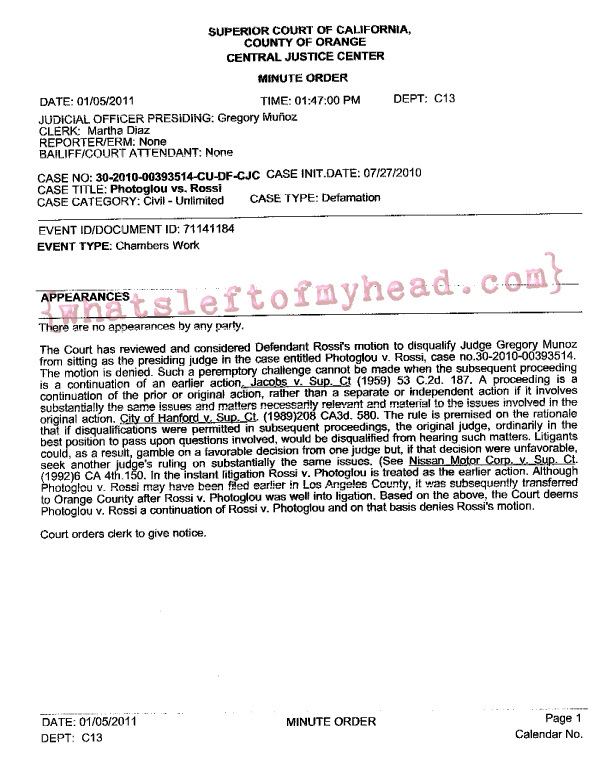 The Court has reviewed and consider Defendant Rossi’s motion to disqualify Judge Gregory Munoz from sitting as the presiding judge in the case entitled….The motion is denied…. Well, well, well…looks like someone filed an appeal. That was pretty much a given in my book…the motion to have the judge disqualified however, surprised me. For 1/100th of a second. In other news…Most Wanted Deadbeats is reporting that Gretchen Rossi’s costar Prince Charming boyfriend, Slade Smiley now owes $138,857.64 in child support for his son, Grayson, who was diagnosed with an inoperable brain tumor in 2006. Nice. Judge Gregory Munoz of Orange County Superior Court determined Wednesday that Rossi, 33, must pay Photoglou the $40K, since the judge threw out the defamation part of her lawsuit against him, and Photoglou spent about $85,000 defending himself. 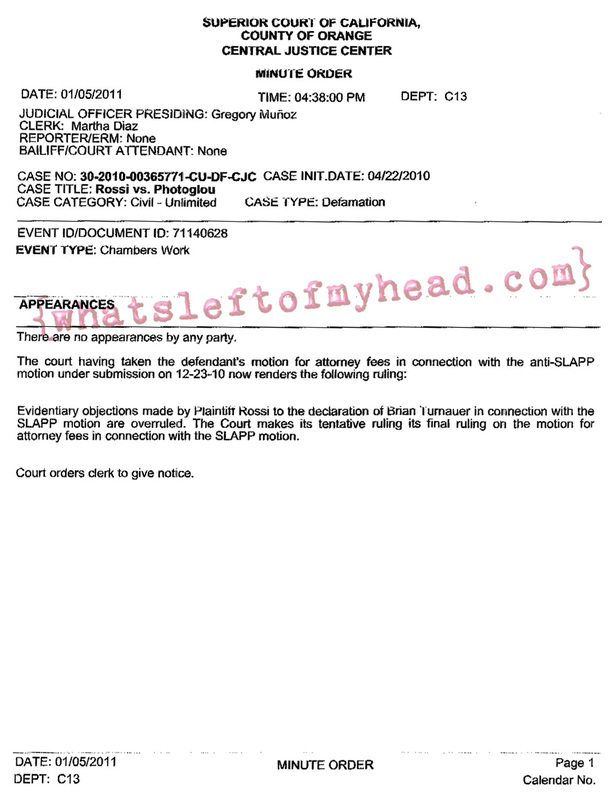 Photoglou and his attorney, Bryan J. Freedman, had filed an Anti-SLAPP (Strategic Lawsuit Against Public Policy) motion in Rossi’s case against him, arguing that Photoglou had the freedom of speech rights to say he was once her boyfriend. The Anti-SLAPP motion prevailed…. Should Gretchen Rossi be forced to pay Jay Photoglou’s attorney’s fees? Yes, I agree with the judge. No, Jay should get a life. What's Left Of My Head is powered by	WordPress 3.1 and delivered to you in 0.127 seconds using 21 queries.